1. Mel Robbins 5 Second Rule = Amazing! Say it with me . . . 5, 4, 3, 2, 1 – GO! This echoed the halls for the rest of the week with examples of how everyone was using it: getting up early to make it to Yoga, to taking that leap out of their comfort zone to connect with other attendees. Mel's personal stories and the science she backed it up with was spot on. Don't wait for whatever you want or need to do next. Five seconds is all you've got before your brain convinces you otherwise, so just GO for it! 2. "Corinne's class on the 10 Top Apps for Admins was by far the best class." She is a technology queen with so many wonderful tools for the administrative workplace. A few of the apps mentioned to checkout: Google Translate, Office Lens, LastPass and Glympse. 3. New Mobile App – Great Tool! Access to all the presentations, an activity feed, and the ability to network with other attendees pre-event, onsite, and ALSO post-event. Check back any time for the next 3 months for updates. 4. Today's workforce currently has 4, sometimes 5 generations working together. We all know the stereotypes around each generation. Meagan Johnson enlightened us on the realities and true characteristics of each with her Decoder Logic and research. Now we can all work more effectively with each other back at the office. 5. Dan Thurmon was incredible. His presentation focused on his core message about how work/life balance is impossible to reach – so be Off Balance on Purpose. He didn't just speak though – he hit his message home by physically showing us how to be Off Balance on Purpose with his incredible acrobatics!!! 6. "The keynotes touched our hearts; the sessions our heads—both are needed. Expanding my network increases my professional resources and let's me feel part of a community. That's why I come." 7. Finding your purpose comes down to 2 important days in your life. "The day you were born and the day you figured out why you were born" – quote by Mark Twain – shared by Joi Gordon on opening night. Her closing poem was by far one of the highlights of the Conference – "I Promise Myself: to be strong that nothing can disturb my peace of mind, to talk health happiness and prosperity to every person I meet, to make all my friends feel that there is something worthwhile in them, to look at the sunny side of everything and make my optimism come true..."
8. "The workshops and seminars were extremely helpful, very informative. I can apply all of the information I learned to my job and it will make me a better all-around person." 9. The varieties of topics are fantastic! From Project Management; to Emotional Intelligence; to Grammar and E-Writing at Work; to Collaboration Techniques; to Body Language Skills; to Virtual Reality in the Admin World! So many choices so little time. It's a bonus that most presentations are online post-conference AND that audio recordings synched to the slides are available for attendees. 10. 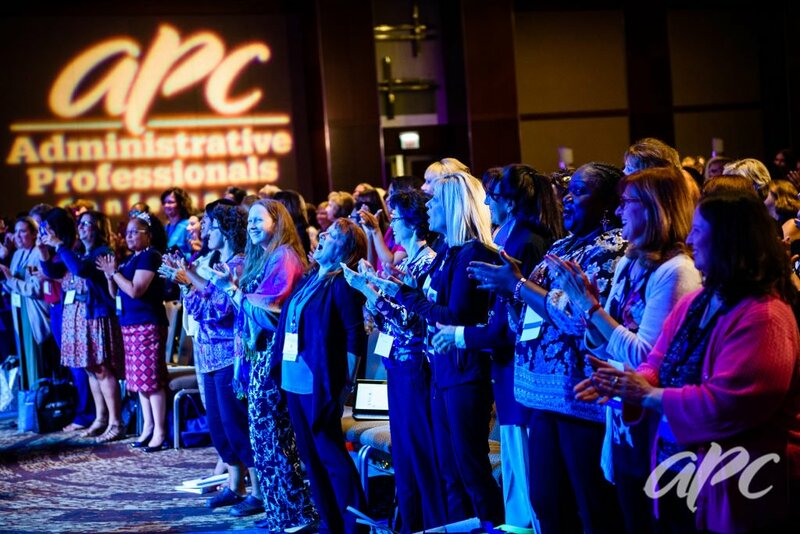 APC and EA Summit is THE place for administrative professionals and Executive Assistants to meet, network, and learn each year. With an experienced and active Advisory Council, expert Trainers, carefully selected Keynotes, skillfully organized special events and activities, and a top-notch Team of Staff-members, attendees come away with a true experience of a lifetime!